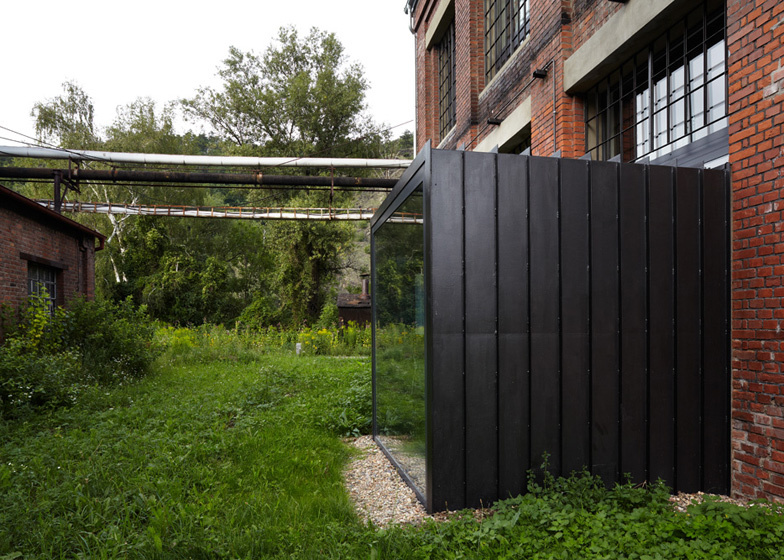 Czech architecture studio Atelier Hoffman has converted a riverside coal mill near Prague into a studio, workshop and exhibition space (+ slideshow). 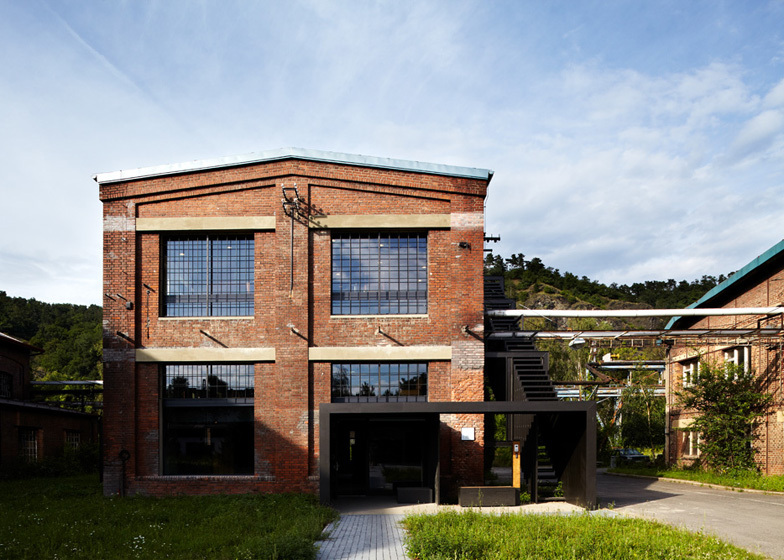 The three-storey brick and steel building dates back to the start of the twentieth century, when it was first constructed on the site of a factory in the town of Libčice nad Vltavou. The floors were only installed in the 1960s and the building had served as a warehouse since then. 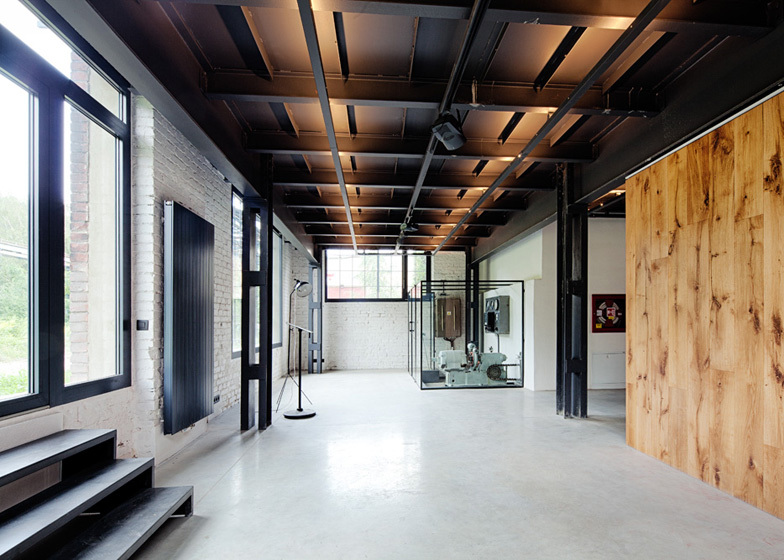 Since 2006, Atelier Hoffman director Patrik Hoffman has been trying to find a way to renovate the structure. 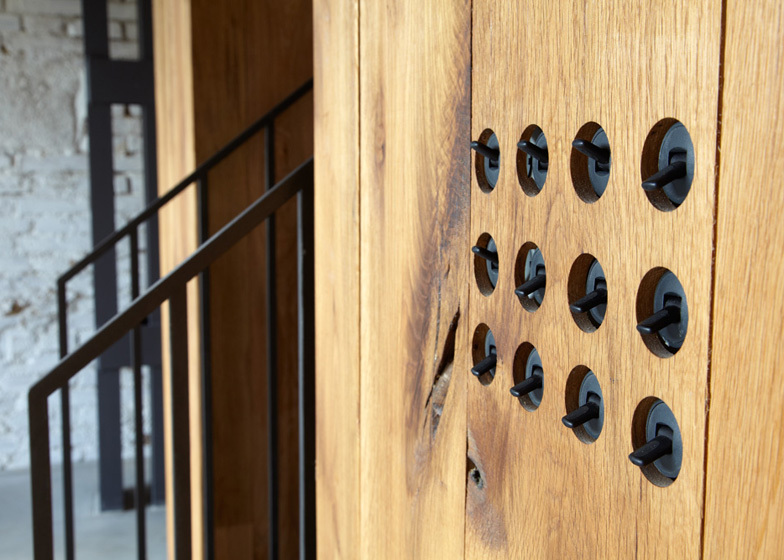 "The screw mill kept mesmerising me," he explains. "In that vacated mill once more than 1600 people used to live and work, nowadays not even a hundred have remained. And yet everything is there! Houses, railway tracks, road, technical infrastructure, river, grown up trees. It has a great genius loci. 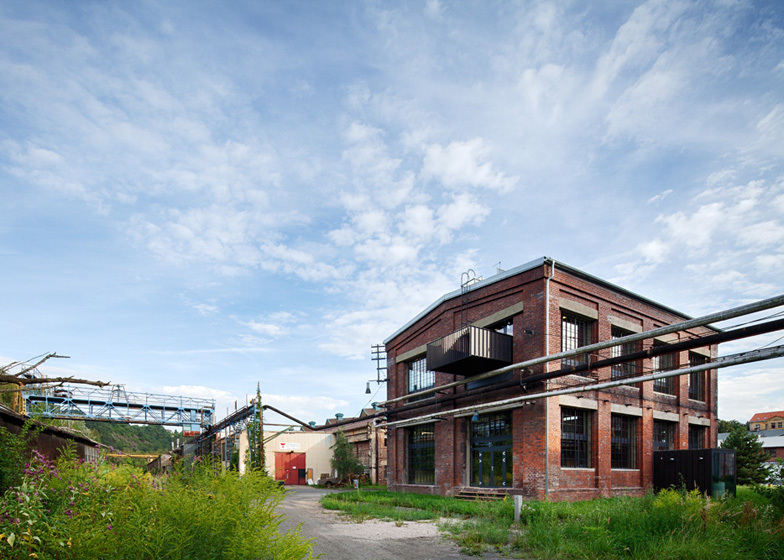 The premises are dilapidated and forsaken, but all it takes is to bring it back to life." 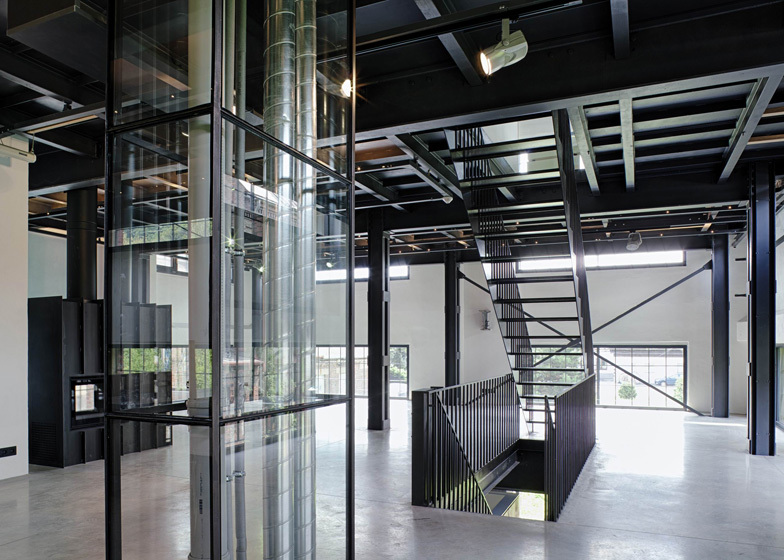 The architects have added a series of steel volumes that protrude from different sides of the building. At the front, an outer staircase and entrance pavilion wrap around the corner of the walls to provide access at both ground level and the uppermost floor. 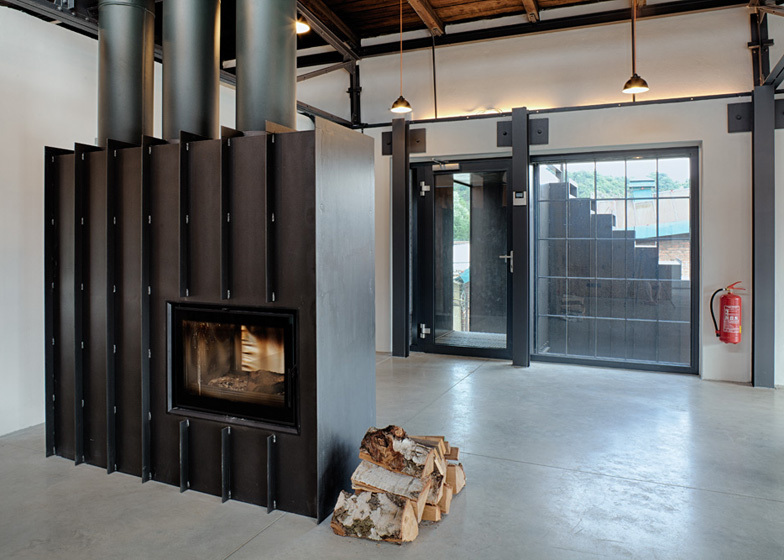 Another steel box creates a top floor balcony, while one on the ground floor accommodates a boiler room. 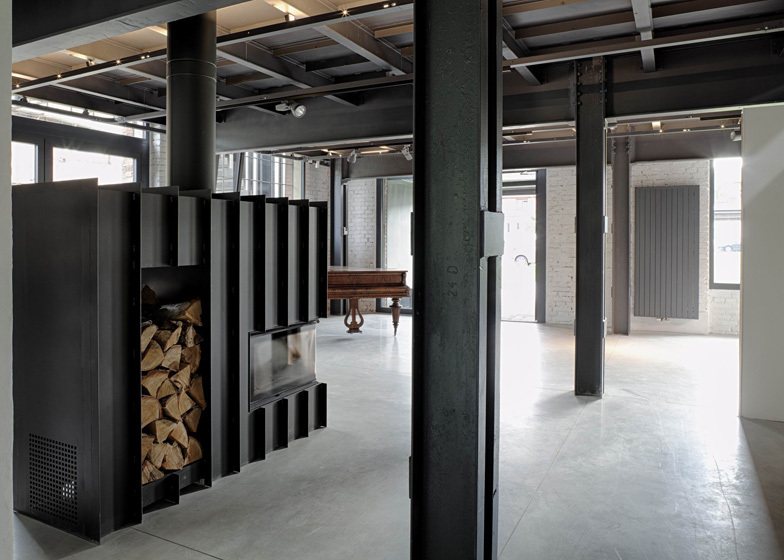 Original steel I beams and trusses are visible on each level and have been smartened up with a protective black coating. A new steel staircase with the same finishing zigzags up between the floors. 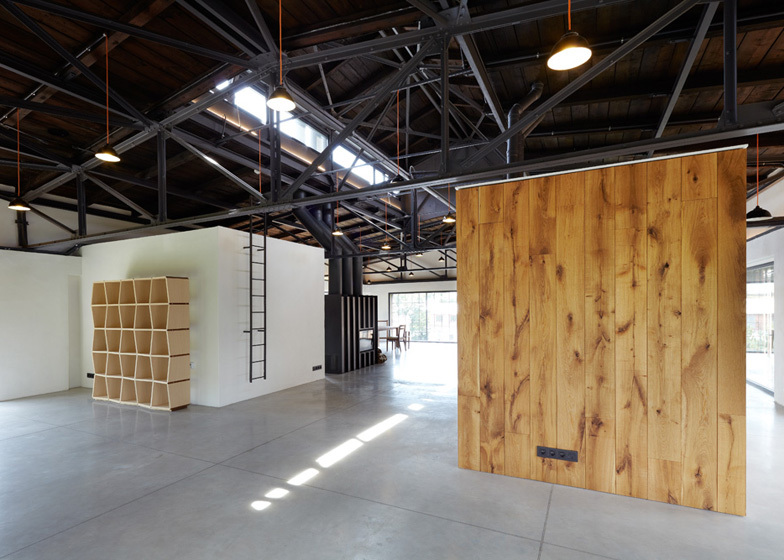 Kitchens, bathrooms and storage facilities are contained inside large wooden boxes. 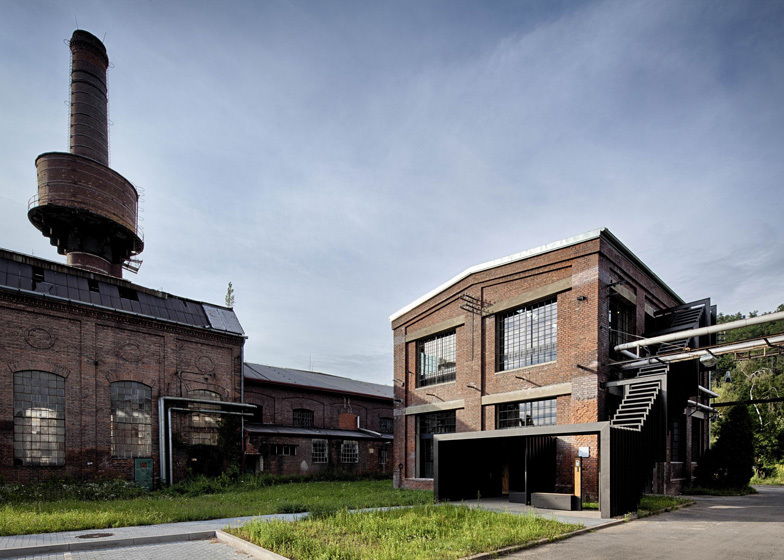 Other recently completed renovations in the Czech Republic include a hair salon that looks like a cross between a warehouse and a dungeon and a gym with a running track on stilts. See more architecture in the Czech Republic. Photography is by Andrea Thiel Lhotakova. 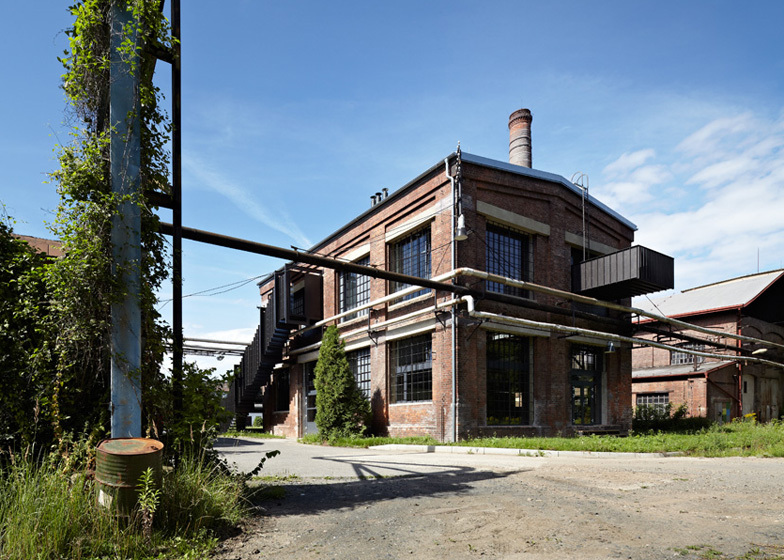 The building is situated on the premises of a former screw mill in Libčice nad Vltavou on the banks of the Vltava river, to the north of Prague. 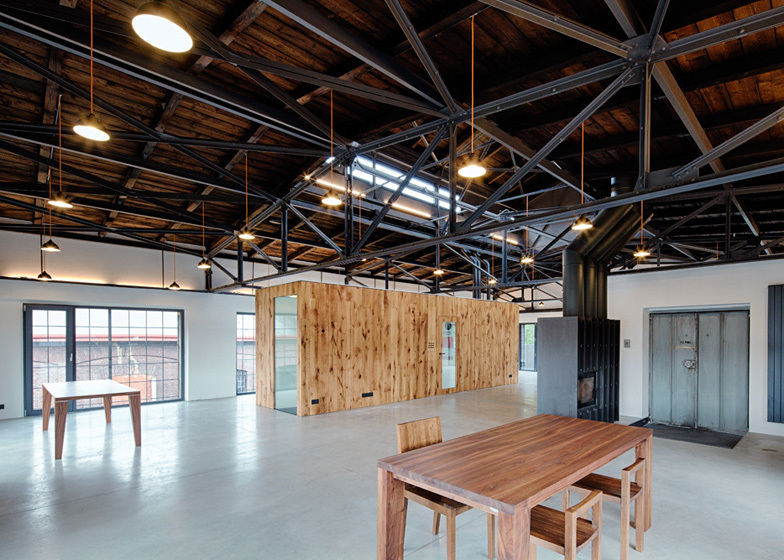 The screw mill was founded in 1872, the coal mill building originates from approximately 1900. The original two-storeyed edifice of 12.1 by 17.5 metre and height of 11 metre was split in 1965 by a steel construction in three levels. Since then it served mainly as a warehouse. 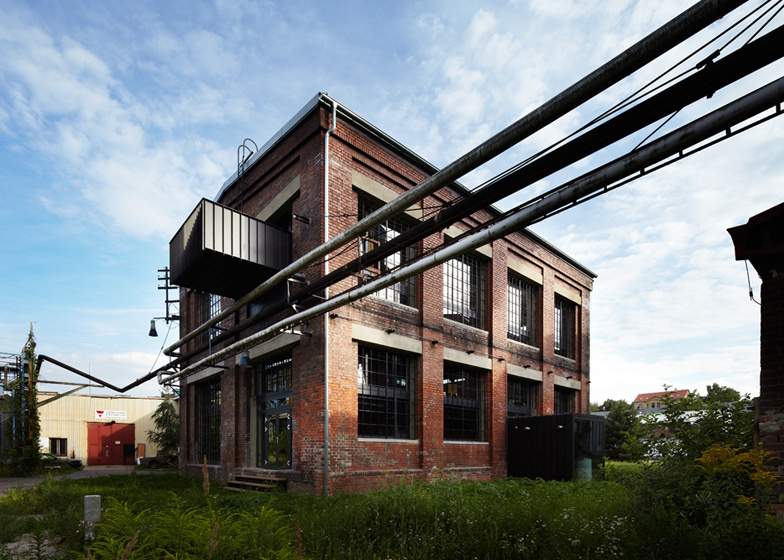 The building was bought in 2010 by LUGI Ltd and Patrik Hoffman. 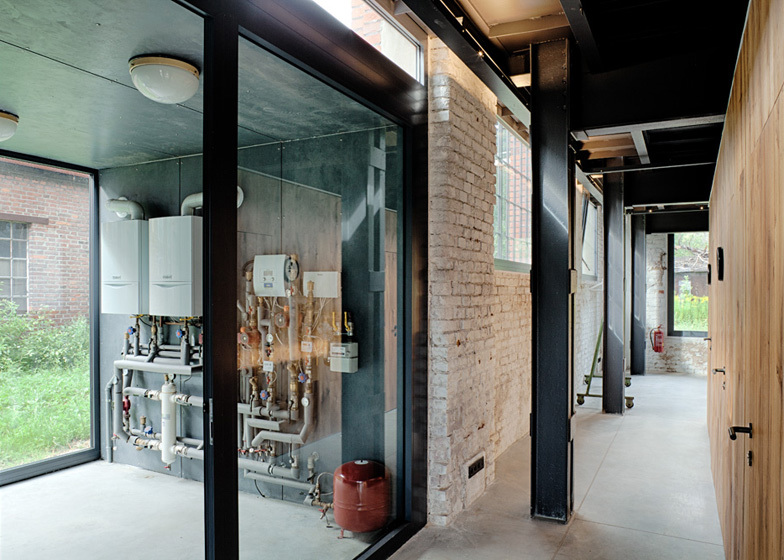 Renovation works were carried out between June 2010 and December 2011 following a plan and project by the architectonical studio Patrik Hoffman. 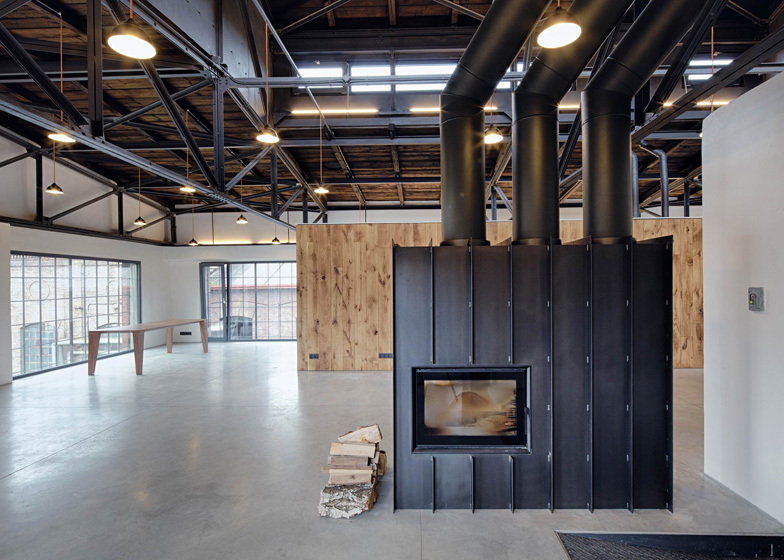 In a join effort, the building of the old Coal Mine was transformed into an inspiring working environment and will continue to be used as a polyfunctional facility in which architecture, design, art, manufacture and warehousing meet each other. When looking at the reconstructed coal mill it should be obvious what is original and what has been added. 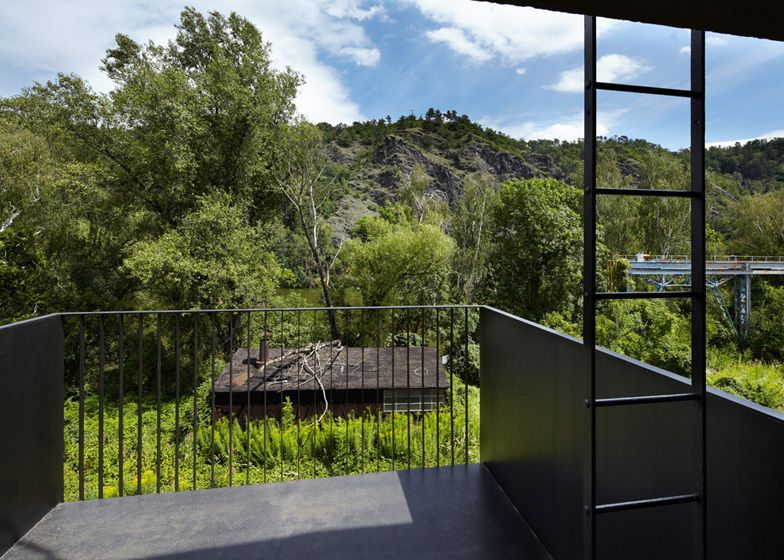 The masses of the newly added outer parts have been carried out as a system of interconnected steel boxes (entrance pavilion, staircase, balcony, boiler room), made of 4mm thick metal sheets in order to minimise the impact on the original look of the building. We took the same approach to renovating the interiors. Added constructions were removed and the existing interior staircase was replaced by a newly placed steel staircase. The original steel construction was cleaned and given a coating. 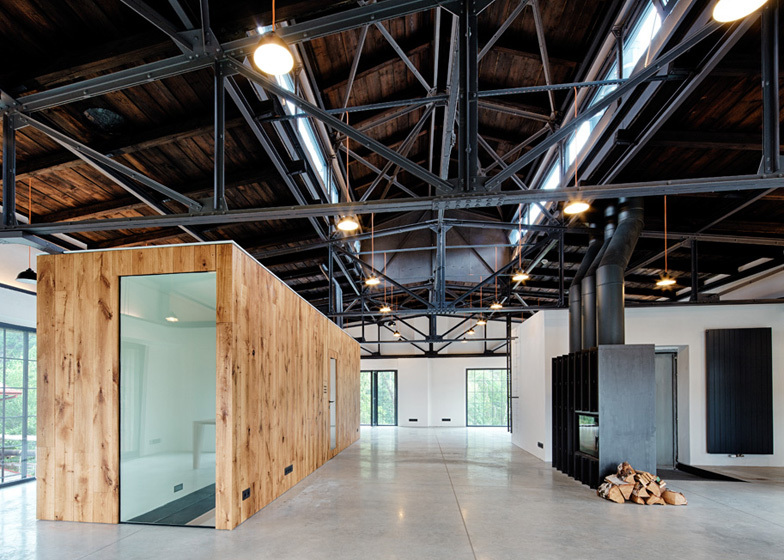 All the facilities such as bathrooms, kitchen, cleaning closet has been hidden in independent wooden "boxes" placed freely in the space in order to accentuate the construction of the edifice with its openness and generous feel of open space. The steel roof truss structure was left in its original shape including wooden rafters and lagging. Window openings have been fitted from the inside by new aluminium windows with insulating double glass and the original steel window frames were repaired and maintained. It is our wish that this project may be an impulse to change a forsaken brown field in a centrum where one can find studios, manufacture, showrooms and interesting shops. May it become a place that inspires.